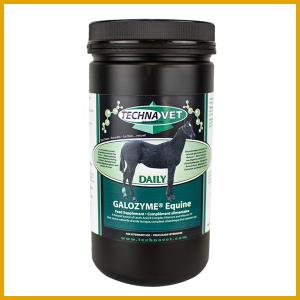 Riders of all disciplines and levels have embraced Galozyme® Equine as their #1 dietary support products for their animals. Our unique blend of high quality additives insures optimum results. Our customers have claimed Galozyme® Equine to promote but not limited to, optimum digestive health, better pre breeding health, better focus, drive, weight management and overall appearance (see some of our customer testimonials). We look forward to working with you to help your horse(s) reach its( their) highest potential! Whether it’s a show horse, of any type of discipline, or just a companion trail horse, try it, and see the amazing difference. Your horses will prove to you how much they love it. 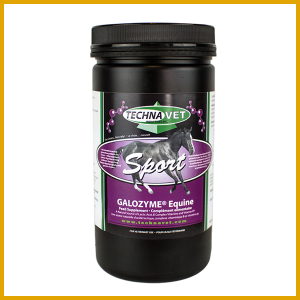 “We have been using Techna Vet's Galozyme® Equine supplements for two years. In that time our horses have we have seen a substantial improvement in our horses. They look and feel fantastic. They are on the road and competing for several months of the year and they always continue to eat and drink while being hauled and remain focused. Our older horses maintain their weight and continue to be competitive in the rodeo arena. We have so much success with our horses and much of this is due to such a great product. Thank you Techna Vet!! Dale and Cheryl Anderson and family, Twin X Ranches Ltd.
“I have been using your Galozyme® Equine Sport product for quite a few months. I absolutely love it and has made a huge difference in my barrel horse. He is focused, running hard and eating and drinking so much better on the road. Also they even look great too! I have had people ask me what I feed my horse to make him work and look so good and I always mention Techna Vet products, mainly the Equine Sport. 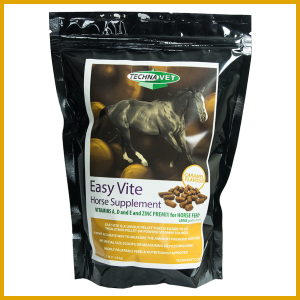 By being on this product my horses have improved condition and have been trying so much more. Its hard to try new things and Im glad I did as this is by far the best probiotic I have found on the market. Thank you!